Spirituality and Religion are very personal subjects, and we offer a variety of items in an attempt to help in the choice of this self-fulfillment item. 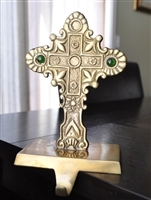 We provide vintage pieces from a crucifix, figurines, rosaries, candle holders, stocking holders, display items worthy of keeping for yourself, gifting to a clergy person, or purchasing it for the church. Folk Art icons, religious-themed sterling jewelry, and decoration provide some of the choices. Depose Italy, Polish sterling silver pendants, chains, European, Italian, and American vintage items catter to your taste. Vintage religious keychain with Cross and Jesus on the opposite sides, enclosed clear capsule on metal chain. Spiritual gifts in set of 4 medals and cross spiritual gifts. Vintage Navy Blue beaded rosary with metal cross and chain links. Vintage glow in the dark plastic rosary in off white color. Our Lady of Guadalupe material Icon with hanging loop. Hematite tubes long rosary with metal INRI cross and pendant. Miniature Nativity set hand carved clay and large straw fill basket. Vintage Angel playing instrument, Italy 5522. OLIVE WOOD Aqua Jordanise Rosary with metal chain links and INRI Christ cross. Nativity porcelain trinket box with Mary, Joseph, and baby Jesus. Joyful Mysteries plastic vintage Rosary, Pledge to the Victory. Rosary in clear but colorful beads and metal cross with pendant, vintage rosary. Blessed Virgin Mary with Jesus Italian rosary and wooden links stretched Saints bracelet. 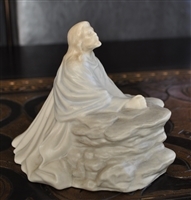 Spiritual display porcelain figurine of praying man or Jesus in pastel color finish. Collectible set of 3 pins, Bavarian beer, Clergyman, and St. Patrick's Duck. Vintage Spiritual plate in scalloped design and 18K gold trim, Japan. Vintage Infant of Prague Statue Hard Plastic, car dashboard display made in Hong Kong. Daily Food miniature prayer book. Vintage wall hanging relief cherubs and angels in gold and ivory tone design from DART IND 1971. Holiday TIme Vintage Christmas tree top angel with 10 lights. Depose Italy Fontanini music box drummer boy, Simonetti 1989. Fontanini DEPOSE Italy Angel Cherub playing violin, spider mark. 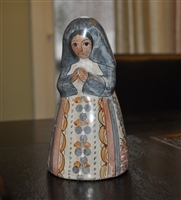 Praying Nun Folk Art vintage clay figurine. INRI vintage Cross that is slim in design and 10" long in rich gold tone brass. Antique Mater Dolorosa pendants rosary with Stations of the Cross made in France. Vintage wooden cross with brass face and Angel brass candle snuffer. Vintage First Communion Blue Rosary with metal Cross. Vintage Our Lady of Guadalupe Hologram round pendant. Vintage glass Crucifix set of two candle holders on hexagonal base and with Frosted glass Jesus figure. Vintage icon Santisima Virgen de Juquila Ruega por nosotros paper decoupage, framed Mexican art. 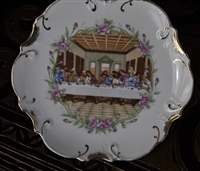 Last Supper from Giovanni Collection by Turtle King Corp resin wall art plaque. Religious brass cross stocking hanger, vintage, Christmas. CHUBU CHINA Lily of the Valley hand painted Cherry Exclusive Happy Birthday teacup and saucer vintage pre Occupied Japan porcelain set. Zuni Pueblo Ulysses Mahkee Fetish Ram in Pipestone Ram design carving. Depose Italy ink sign by Fontanini Simonetti woman figurine, 2003. 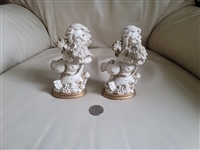 Praying hands metal vintage bookends set from IM company in tarnished antique gold color. Noah's Ark thick tapestry throw blanket in a colorful design by Goodwin Weaver, cotton.